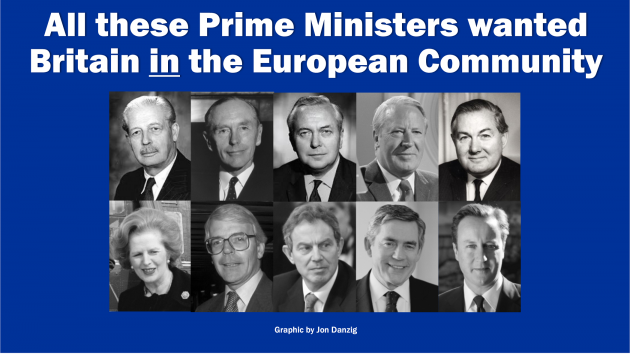 All the past British Prime Ministers since 1957 wanted Britain to be a member of the European Community. Could they all have been wrong? In the past 62 years, there’s only one Prime Minister who wants us to turn our back on Europe – the current incumbent, Theresa May. 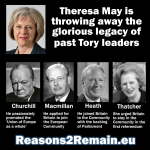 Britain is now throwing away the combined wisdom of ten consecutive past Prime Ministers, all of whom wanted Britain to be in the European Community. In 1961, Harold Macmillan applied for Britain to join the European Economic Community, just four years after it was formed with the signing of the Treaty of Rome by six other European countries. “By negotiating for British membership of the European Economic Community and its Common Market, the present Conservative Government has taken what is perhaps the most fateful and forward looking policy decision in our peacetime history. “I, too, have concluded through the years that membership of the Community would be advantageous to Britain. “I almost add ‘necessary for Britain’, because I am acutely conscious that there are two questions which have to be asked : not only whether we should go in, but what is the prospect for Britain if we stay out. It was Conservative Prime Minister, Edward Heath, who joined Britain to the European Community following the backing of Parliament after 300 hours of debate. “Surely we must consider the consequences of staying out. We cannot delude ourselves that an early chance would be given us to take the decision again. 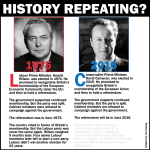 Parliament did endorse the Motion, and Britain subsequently joined the European Economic Community on 1 January 1973. 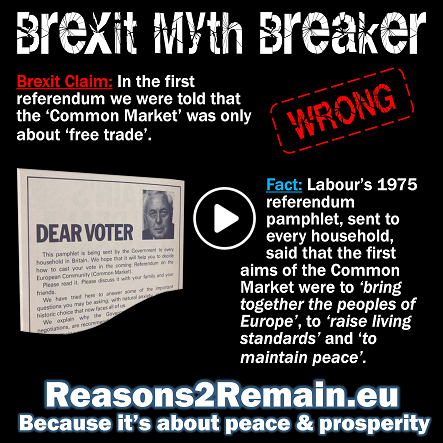 In 1975, just two years after Britain joined the European Community (also then called ‘the Common Market’), Prime Minister Harold Wilson offered the nation a referendum on whether to remain a member. In that referendum, Mr Wilson endorsed the ‘Yes’ vote which won by a landslide – by 67% to 33%. During the referendum campaign, he said that he was recommending continued membership in “strong terms”. • To bring together the peoples of Europe. • To raise living standards and improve working conditions. • To promote growth and boost world trade. • To help the poorest regions of Europe and the rest of the world. • To help maintain peace and freedom. 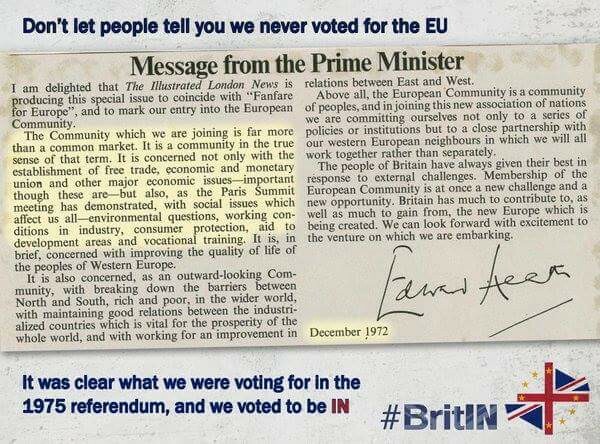 As Foreign Secretary during the first referendum on Europe in 1975, James Callaghan supported the ‘Yes’ vote for Britain’s continued membership of the European Community, having led the negotiations for Britain’s new terms of membership. The manifesto called for Greece, Portugal, and Spain to “receive an early welcome into the Community” and for reforms to the European Community’s Common Agricultural Policy. During the referendum campaign of 1975, the Conservative leader, Margaret Thatcher, strongly campaigned for Britain to remain a member of the European Community. During her tenure as Prime Minister, Mrs Thatcher is credited with pushing for, and making possible, the Single Market of Europe. 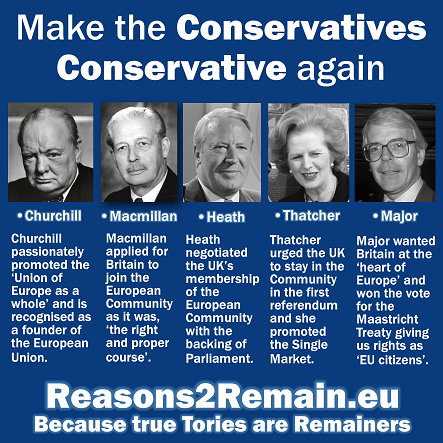 It was Conservative Prime Minister, John Major, who negotiated and won Parliament’s backing to sign the Maastricht Treaty, that among other benefits gave us EU Citizenship rights allowing us to reside, work, study or retire across a huge expanse of our continent. “We would be breaking Britain’s future influence in Europe. We would be ending for ever our hopes of building the kind of Europe that we want. “And we would be doing that, just when across Europe the argument is coming our way. We would be leaving European policy to the French and the Germans. “Let us not forget why we joined the Community. It has given us jobs. New markets. New horizons. Nearly 60 per cent of our trade is now with our partners. It is the single most important factor in attracting a tide of Japanese and American investment to our shores, providing jobs for our people..
Tony Blair, Labour’s longest-serving Prime Minister and, so far, the longest-serving Prime Minister of this century, was and still is a natural pro-European. Gordon Brown was the first Prime Minister from a Scottish constituency since the Conservative’s Sir Alec Douglas-Home in 1964. He came into power just as the world was going into economic meltdown. He was proud to say that Britain today was a country “not in Europe’s slipstream but firmly in its mainstream”. • “the most comprehensive social protection anywhere in the world”. David Cameron was the only leader of a main political party to call for a second referendum on Britain’s membership of the European Community. During the subsequent 2016 referendum campaign, he urged the country to vote to ‘Remain’ in the EU, which was his government’s official position. “Britain is better off inside the EU than out on our own. At the heart of that is the Single Market – 500 million customers on our doorstep…a source of so many jobs, so much trade, and such a wealth of opportunity for our young people. “Leaving the EU would put all of that at risk. “I believe, very deeply, from my years of experience, that we’ll be stronger, we’ll be safer, we’ll be better off inside Europe. To put it as clearly as I can: our economic security is paramount. ▪ ALL OF THESE 10 PRIME MINISTERS had good points and bad points, and policies that not everyone agreed with. But during their premierships, they all without exception unanimously supported our membership of the European Community as being in Britain’s best interests. Could they all have been wrong? Please think about it. 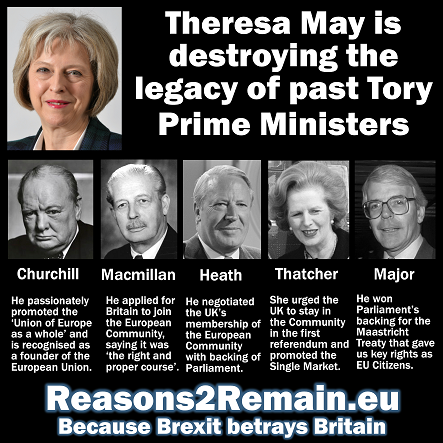 Just one Prime Minister (Theresa May), out of Britain’s eleven Prime Ministers of the past 62 years, wants us out of Europe, when all the other Prime Ministers wanted us in. * Before Harold Macmillan, Sir Anthony Eden was Conservative Prime Minister from 1955 until he resigned on 9 January 1957. He was a Eurosceptic who made the momentous decision for the UK not to be a founder member of the European Economic Community, when six other European countries signed the Treaty of Rome, just two months after Sir Anthony left office. This entry was posted in Current Affairs, Democracy & Citizenship, Economics & Trade, Politics & Public Policy, The EU and tagged Alec Douglas-Home, brexit, Common Market, David Cameron, Edward Heath, EEC, European Economic Community, European Union, Gordon Brown, Harold Macmillan, Harold Wilson, James Callaghan, John Major, Margaret Thatcher, Theresa May, Tony Blair. Bookmark the permalink.